Trailheads is taking a little breather this week to digest all those cookies, watch A Christmas Story a few more times, and make a couple of New Year’s resolutions that will be forgotten by February. Centre Daily Times photos of the Pearl Harbor Remembrance Day tribute at the Pennsylvania Military Museum were featured in a compilation slideshow of December 7 commemoration events around the country. You can view them here (photos 18, 19, and 21). You can see a slideshow of the Dec. 9 dress rehearsal for the annual Christmas crossing of the Delaware at Washington Crossing Historic Park here thanks to Bucks Local News. GoErie.com posted photos of the Christmas Tree Ship program at Erie Maritime Museum and Flagship Niagara on Dec. 14. This year's event drew about 1,000 people to see the ship adorned with lights, talk to Santa on board, and enjoy Christmas music and storytelling. You can see the photos here. The restoration project on the George and Frederick Rapp houses at Old Economy Village received some thoughtful coverage here by Pittsburgh’s Trib Total Media. Next week we’ll give you the January program preview. Until then, best wishes and warmest regards for a safe and happy new year’s celebration. See you in 2013! Somehow my planned witty (?) remark about the Mayan calendar seems utterly inappropriate since so many families in Newtown, Connecticut, have just experienced what I imagine must feel like the end of the world. My heart goes out to all who have been touched by this tragedy or by other losses that make family holiday gatherings a whirl of mixed emotions. Many or most of us know what it’s like to have an empty chair at the table, so to speak, even if the loss isn’t as raw as it is for the families of the children and adults who died at Sandy Hook Elementary last week. In the coming days, as last-minute Christmas or Kwanzaa preparations and New Year’s activities make us a little frantic, I hope we will all take time to cut each other some slack and remember to be kind. Yes, even when someone takes your parking space. Maybe we can help reduce the amount of hate in the world. On a less somber (and preachy) note, there are activities on the Trails of History in the coming week as well. All sites except Washington Crossing are closed on December 25. Some sites will be closed on Christmas Eve, either because they’re open only by appointment until spring or because they’re closed on Mondays. Some sites that are open that day may close early. So, please check ahead to avoid disappointment (the same goes for New Year’s Eve). Tomorrow is Landis Valley Village and Farm Museum’s Old Fashioned Children’s Christmas from 10 am to 3 pm. Activities and projects will be centered on this year’s gingerbread theme. No registration is needed and the activities are included in regular admission (which is free for members of Landis Valley Associates). Next week, on Dec. 27 and 28, the site will offer its popular Winter Day Camp for kids age 5-11. Registration is required and there are discounts for LVA members and for multi-day registrations (go here for details). At Washington Crossing Historic Park, reenactors will step into the Durham boats at approximately 1 pm on Christmas Day to commemorate the night of Dec. 25, 1776, when George Washington and his troops crossed the icy Delaware River to mount an attack on British and Hessian troops in Trenton, New Jersey. This year is the 60th anniversary of the Crossing reenactment, which also features speeches and readings related to the American Revolution. The event is free and happens rain or shine (river conditions will determine the actual launch of the boats). Ephrata Cloister’s Lantern Tours (Dec. 26-29) are a wonderful way to experience the site and learn some of the history of the celibate sisters and brothers, as well as the other community members who worshipped with them. The presentations feature junior and senior high school students who work with site staff on this annual event. This year's program focuses on the winter of 1769, when a property dispute divided the community. Tours start from the visitor center on the half hour, 6:30 to 8 pm. You’ll need tickets for this program (Ephrata Cloister Associates and members of the Pennsylvania Heritage Foundation receive discounted admission). Call 717/733-6600 to reserve your spot. Young children and their families can ring in 2013 a little early at the State Museum of Pennsylvania's Noon Year's Eve program on Dec. 27 from 10 am to noon. This year the focus is on the arts, and activities will be available throughtout the museum. Families will gather in Memorial Hall at noon to see the Museum's large firefly drop, along with lots of balloons. The program is included in regular museum admission; reservations are not needed. Go here for more info. As I’m sure you know, museum stores offer a wide variety of cool stuff that you may not find other places; they provide an opportunity to shop local and (often) buy local; and they help support museums and historic sites. Obviously, I’d love for you to visit one of our stores on the Pennsylvania Trails of History, (www.patrailsofhistory.com) but if you can’t, please consider shopping at a museum store for someone on your gift list (or for yourself—I promise not to tell). One final plug. As the sesquicentennial of the Civil War continues, a new book, The Civil War in Pennsylvania: A Photographic History, might be just the thing for someone interested in the Civil War and/or historical photography. 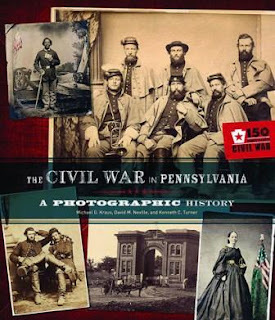 A project of Pennsylvania Civil War 150, the book was published by the Senator John Heinz History Center, Pittsburgh. You can order it (and other Civil War and Pennsylvania history-themed goodies) from the Pennsylvania Heritage Foundation through the Shop PA Heritage website. Happy shopping! And thank you. As the weather flickers back and forth between unseasonably warm and seasonably chilly and holiday preparations are in full swing (Happy Hanukkah to those celebrating the festival of lights in the coming week), sites on the Trails of History are hosting a number of programs. Many of them are long-cherished traditions in their communities. Most were listed in last week’s post, but they bear repeating, I think. Pennsbury Manor’s annual “Holly Nights” program concludes this evening (6-9 pm), with entertainment, firelight, greenery, hot cider, and cookies. You can tour the Manor House by candlelight, make a pomander ball, listen to instrumental and choral music performed by groups from the local community, and see a Mummers Play (mumming is a British holiday tradition—you can read more about it here). Check out Pennsbury’s website here for the entertainment schedule and a downloadable discount coupon. 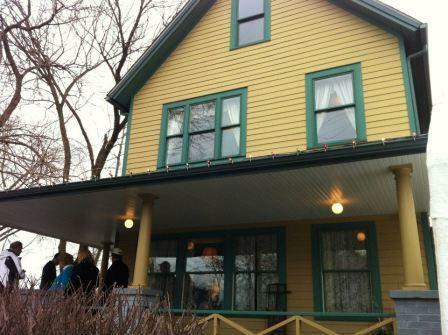 “Victorian Christmas” continues this weekend at Eckley Miners’ Village. The Sharpe House, built in 1861 and restored to its 1874 appearance, is decorated for the holidays. Enjoy cookies and tea; tea cups and Christmas ornaments will be available for purchase to support the museum’s programs (donations are also welcome). The program takes place from noon to 4 pm Saturday and Sunday. You can find photos of last year’s event on Eckley’s Facebook page here. “Country Christmas Village” is Landis Valley Village and Farm Museum’s annual exploration of Pennsylvania German holiday customs. Christmas trees of many varieties, an elaborate miniature village scene, and a visit with der Belsnickel (more “Get off my lawn” than “Ho, ho, ho,” but still not to be missed). Be sure to stop by the tavern for hot cocoa and gingersnaps. The program is included in regular admission and takes place Saturday, 10 am-4 pm, and Sunday, noon-4 pm. Not to confuse things, but on the other side of the state, Old Economy Village will present its traditional program, “Christmas at the Village,” this weekend. Paths will be lit by lanterns, and visitors can browse beautiful handmade gifts in the Feast Hall, tour the cobblestone street by candlelight, and enjoy some 19th-century window shopping. There will also be activities for children, including a visit with Belsnickel, who will check his book to see who’s been naughty and who’s been nice. Please purchase tickets at the Visitor Center and then take a horse-drawn carriage to the village. The program takes place Saturday, 2-9 pm, and Sunday, 2-7 pm. On Sunday, Daniel Boone Homestead presents “A Homestead Christmas,” complete with crafts, light refreshments, blacksmithing demonstrations, and horse-drawn wagon rides. The Wayside Lodge will be playing the role of Santa’s Workshop as kids visit with Jolly Old Saint Nick and help him make 18th-century-style toys. Shop for unique gifts in the museum shop (and enjoy some wassail) and keep an eye out for the Belsnickel. That’s right, Santa AND Belsnickel on one day—you can compare and contrast as you learn about different Christmas traditions. Admission is $4 for ages 4-12 and $6 for ages 13 and older; Friends of DBH get in free. The program takes place on Sunday only, noon-4 pm. If you can’t make it to Washington Crossing on Dec. 25 to see the Christmas Crossing event, you might want to attend the “Dress Rehearsal” this Sunday. In addition to the practice run for the yearly reenactment of Gen. George Washington and his troops crossing the Delaware River, Sunday’s event includes lots of other activities including open hearth cooking. Last month, the Chicago Tribune listed the Crossing events in Pennsylvania and New Jersey to its list for travelers who want to start new family holiday traditions. (Thanks to the PA Tourism PR Team's (@patourismpr) Twitter feed for that little piece of news.) Go here for more info. Admission is $4 for ages 5-11, $8 for 12 and up; the event runs from 11 am to 3 pm, with the crossing at about 1 pm. By the time you read this, tickets for “Christmas at the Cloister,” Monday and Tuesday, Dec. 10-11, (that’s Ephrata Cloister, of course) may be sold out, but it’s worth checking (seats for the 9 pm performances always go last, so if you’re able to stay up that late you may be in luck). You’ll find more info here. On Tuesday, Dec. 11, visitors to Drake Well Museum will be admitted for free if they make a donation to the Salvation Army’s Red Kettle Campaign. This is the museum’s third free admission day this fall offered in partnership with a community organization (previous efforts collected food and household supplies for a local food pantry and for the local YWCA shelter for women and children). If you haven’t seen the new exhibit at Drake Well, this is a great opportunity to do so and help the museum help the Titusville community. Whatever you decide to do, I hope you have a wonderful and safe weekend!